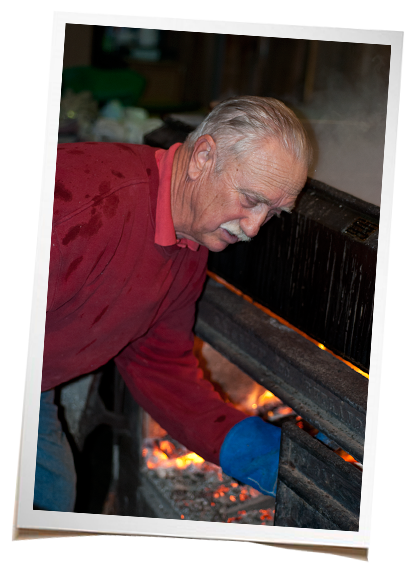 Martin Collins, a master of crafting delicious Pure Vemont Maple Syrup with over 50 years of experience, uses a wood-fired evaporator to transform sap into maple syrup. Since our sugarhouse is situated on a large parcel of land, we selectively cut our forest to keep it healthy and fuel our maple syrup operation. We believe that the use of wood as a heat source for reducing sap into maple syrup results in a mineral rich, concentrated maple flavor. Our Vermont maple syrup originates from a single source: our farm located in the heart of Southern Vermont in the pristine Green Mountains. 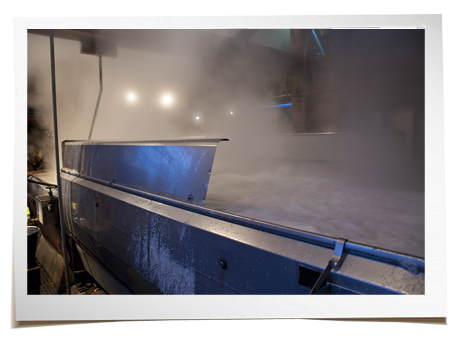 All of the sap-holding tanks and the evaporator pans are made of food-grade stainless steel. A vast gravity run system of plastic pipelines going to each tree and running into progressively larger plastic lines brings the sap down to the holding tanks at the sugarhouse. The raw sap leaving the individual trees has an average sugar content of about 2%. To change this into maple syrup, evaporation must take place to raise the sugar content to 66%. From the holding tanks, sap is fed into the evaporator where it is boiled. It takes between 40 to 60 gallons of sap to produce one gallon of pure Vemont maple syrup. As the sap thickens and becomes maple syrup, it is drawn off from the evaporator. The maple syrup is stored in drums and hot packed into smaller containers according to the needs of our customers. "Our maple syrup is produced from a single source, meaning that all the sap comes exclusively from trees on our farm. We do not buy maple sap or syrup from any other producers." Heat oven to 250 degrees F. Cook popcorn according to package directions. Put popped corn in a slightly buttered bowl. In a saucepan, melt butter, add maple syrup, brown sugar and salt. Boil without stirring for 5 minutes careful not to boil over. Remove from heat. Stir in baking soda and vanilla. Pour gradually over popped corn in a large roasting pan and mix well. Bake 1 hour stirring every 15 minutes. Remove from oven and cool. If you have any questions, concerns or issues, please feel free to call us at (802) 387-5757 or contact us through our form. It takes between 40-60 gallons of sap to produce one gallon of maple syrup. Maple Syrup is a major source of natural antioxidants. 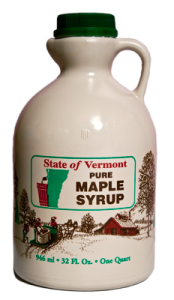 Our Pure Vermont Maple Syrup originates from the sap of the sugar maple tree. Maple syrup is an excellent sweetener for coffee.